I’ve witnessed a Facebook miracle. Someone on my Facebook feed has gone from 200 to 3,000 fans in less than six months. The explosion of fans had me doing double-takes – a few days recently, he was gaining 100 likes per hour. I know firsthand how hard it is to lure fans, and especially to get comments and shares. I wrote about Facebook’s Slow Squeeze on Small Business, showing how they’ve narrowed reach and modified the news feed to push ad purchases. In researching social media, I’ve started to follow some inspiring minds in marketing. I’ve spent hours poring over their tips and tricks to unlock the secrets of building a fan base. I would expect one of these gurus to launch a new page and start gaining fans hand over fist. Instead, to my great surprise, the soaring likes belonged to Scott – the modest artist behind Bucket Of Bolts and self-confessed Facebook neophyte. Since interviewing Scott years ago, I’ve watched him slowly gain Facebook likes and Etsy sales. I had to know the secret behind his sudden meteoric rise; had he unlocked a trick I’d failed to discover from the top Facebook masters? Was he secretly a wizard of viral marketing? The truth was both disappointing and enlightening. Like dieting, there was no magic pill – just good principles and hard work. Scott shared his strategies for building a large and loyal following with me, and the wisdom may surprise you. It goes against many of the things I’ve read from the Facebook gurus, who insist that you’ll have to pay for ads and do some shady fan-gating to get a following. Post interesting content regularly. Scott posts almost every day, and has a strict “all killer and no filler” philosophy. Scott’s unique artwork is engaging without needing filler. I’ve followed Bucket Of Bolts for years and still have no idea what he eats for breakfast – get it? Don’t post something just to post. Don’t clutter up your wall with too many things that don’t have anything to do with your products or business. This jives with what Facebook’s News Feed Director said in a recent TechCrunch interview1 – pages that get lots of comments, likes and shares increase their reach over time. The reverse is true as well – boring pages that don’t get much engagement will see their reach decrease over time. Engage with your fans and followers. Scott does his best to reply to each and every comment on his page. Not all of Scott’s posts get comments – he freely admits to wishing there were more – but he shows his gratitude by thanking anyone who does leave a comment. Be positive. This is Scott’s main strategy, and there’s research to prove he’s on to something2. 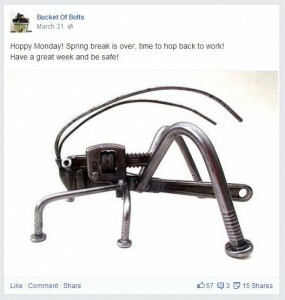 My favorite on the Bucket Of Bolts page is the “Happy Monday” post – a photo of a past project with a positive phrase or thought to start off the week. Be genuine. Scott shines in this area – it’s the reason I’ve been a loyal follower since the beginning. I never feel like Scott is forced in his posts or comments, or trying to sweet-talk anyone. He’s just a very personable and funny guy. Try and be yourself when you write comments. Humor seems to work for me. If I can think of a funny thing to say, I do it. Show the person behind the art. Scott stands with his finished pieces in a number of photos – it gives the item some scale and lets his fans “meet the artist.” It might feel uncomfortable if you’re not photogenic, but seeing an artist with their work will strengthen the relationship with your fans. If you’re just too camera-shy, have someone take pictures of your hands or from behind while you work, so you can connect with your audience without feeling too exposed. Post pictures. The Facebook experts used to suggest posting a variety of content to your page to increase engagement and beat EdgeRank. Those days are over, pictures are by far the front-runner when it comes getting fans engaged and sharing your posts. Scott has this one in the bag; most of his posts are photos of in-progress work. Customers that commissioned work enjoy seeing updates on their project, and others get to see Scott’s talent unfold. 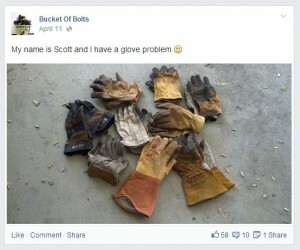 Tip from Scott: I’ve found that single photos get more views than multiple photos posted together in an album. So when I post a finished project, I post 3 or 4 single photo posts instead of a single album post. It’s helped with both views and shares. Expand beyond your target audience. Sellers who only focus their posts on potential customers are missing out on a huge chunk of people who might want to discover what they do. Scott’s most recent followers are fellow welders, professional and novices. Whether or not they make a purchase, these fans are very interested in seeing a work in progress or to read about new equipment he’s purchased. Their engagement helps the reach of his page overall, and keeps him in tune with other artists. 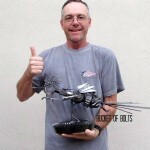 Broadening your audience can also pay off in a big way; Scott recently exchanged messages with a fellow artist who then invited his own 6,000 followers to check out Bucket Of Bolts. “The likes started pouring in like I had never seen before. I started to make milestone signs for every new 100 likes.” Now struggling to keep up with his milestone signs, Scott can point to his fellow artists and welders for many of his new fans. I am very flattered to be an inspirational artist. I hope to encourage others to express themselves. Avoid promotional giveaways. Scott has hosted a few giveaways – the biggest was for his first 1,000 likes. The difference from most sellers is that Scott’s giveaways are solely to appreciate his fans that have liked his page, not to draw in additional likes. Avoid Like for a Like. Likes for other pages shouldn’t be bartered; if you go too far off course in your effort to gain followers, you might find that you lose more than you get. Scott is more than happy to give a shout out, so long as he’s truly interested in the page. 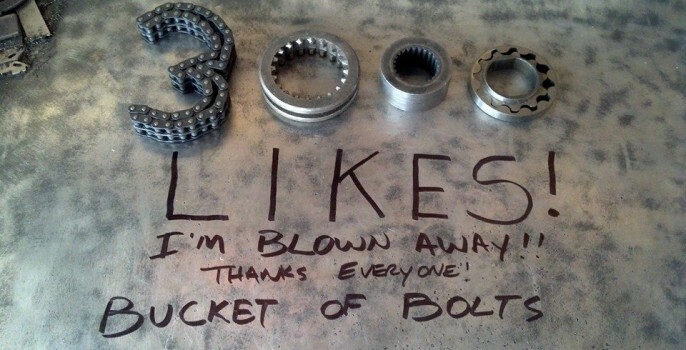 Keep your likes and shares to those that tickle your fancy. Avoid the hard sell. Instead of posting direct links to his Etsy listings, Scott posts photos of the items that he’s working on. Most of Scott’s pieces never even make it to Etsy nowadays, but his Etsy sales are improving nonetheless. Imagine being so busy creating that you no longer need to push for more sales – bliss! Tips from Scott: Do your best on each and every project you work on. Take the best photos you can, and improve them with photo editing software. Make things that appeal to a wide variety of people. Make it interesting, and share your process. The likes will come. Try to work with others who are doing the same type of work you are. It’s way too hard to do it alone. Encourage them, share advice and give fellow artists a shout out. I don’t view other artists as competition, I view them as friends. I want to help them grow, and they inevitably do the same for me. People like what Scott’s page has to offer – the proof is found not only in his 3,000 likes, but the fact that Scott rarely loses a fan. With his no nonsense, all-about-the-art approach, Scott has defied the odds when it comes to small business success on Facebook. Could it work for you? Scott has yet to take other social media platforms by storm. Until he does, join followers from all over the globe on his Facebook page and stop by his Etsy shop to see his ready-to-ship pieces. I need to begin a post almost daily on FB – I’ve felt that was important after seeing some similar FB pages doing that and building a following but now, for sure, I will get a routine going. The tips on what to include in that post are great. I need to come back to this – there are many ideas in here, so I bookmarked it. Once again, thank you so much! Thanks so much Brittany! Your efforts to help others are amazing! A true unsung hero! Thank you, Scott! That means a great deal coming from you. Loved all of the articles, Brittany. Such a great help to us Etsy sellers. Thanks for the sweet comment, Sue! It’s always great to know that the articles are appreciated.